The ranking of the teams for this season of the VELUX EHF Champions League and the EHF Women’s Champions League. The European Handball Federation is gearing-up for the start of the new club handball season, which will begin on Friday, 02 September 2011. The season opens with qualifications rounds of the VELUX EHF Champions League and EHF Women's Champions League, to decide who goes through to the Group Phase/Matches of the respective competition. 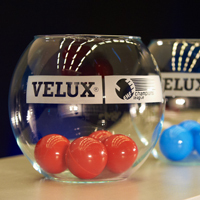 On Monday 27 June 2011 the draw for the VELUX EHF Champions League Qualification Tournaments and the EHF Women’s Champions League Qualification Tournaments 1 and 2 will take place at the EHF Office in Vienna on Monday, 27 June 2011 at 16:00 hrs. On Tuesday 28 June at 11:00 hrs, the draw for the Group Phase of the VELUX EHF Champions League and the Group Matches of the EHF Women's Champions League will take place in the Gartenhotel Altmannsdorf in Vienna. The event will be streamed live at ehfTV.com with interviews and reactions following the draw. EHF seeding lists give an overview over place distribution and pots as well as an overview over the timeline milestones of the competitions. Besides the Wild Card Tournament – read about the modus here – three Qualification Tournaments with four teams each will be played. These tournaments will be carried out in a final four format with one winner going through to the Qualification Tournament 2 stage. In the draw the 12 teams are put in four pots with three teams each according to the seeding list. Then three tournaments with four teams each are compiled. The semi-final fixtures of these tournaments will be decided from the seeding list, with the best ranked team meeting the fourth ranked team and the second ranked team meeting the third ranked team in each respective tournament. Therefore the best ranked teams – IK Sävehof (SWE), HC Metalurg (MKD) and Tatran Presov (SVK) – can only meet the lowest ranked teams – FC Porto Vitalis (POR), Besiktas JK (TUR) and Maccabi Srugo Rishon Lezion (ISR) – in the semi-final, as well as teams from Pot 2 – AEK Athens (GRE), FH Hafnarfjördur (ISL) and Dinamo Minsk (BLR) – will meet a team from Pot 3 – Haslum HK (NOR), aon Fivers (AUT) and RK Partizan Beograd (SRB). There will also be a separate draw to determine the home right of these three tournaments, which will be played on 03/04 September 2011. In Qualification Tournament 1 stage eight teams are drawn into two groups with four teams each. These groups will see a "classic" tournament, with each team facing every other group opponent. Four teams – the winners and the runners-up of the groups – go through to land in Pot 4 of the Qualification Tournament 2. The 16 teams of this stage will be drawn into four groups of four teams each which then again will be played in a final four format with only the four winners qualifying for the Group Matches stage. Also here the semi-final fixtures are compiled from the seeding list, with teams in Pot 1 to meet teams from Pot 4 and teams from Pot 2 to meet teams from Pot 3. For every tournament of both stages there will be a separate draw to determine the home right. Qualification Tournaments 1 will be carried out on 02/03/04 September 2011, Qualification Tournaments 2 will be carried out on 17/18 September 2011.